I have posted WM 110: Reeves & Hill on John 5:4; Text Note: Luke 9:55-56 (listen here). First, I offer some thoughts on a passage from a new book that I have recently begun to read. 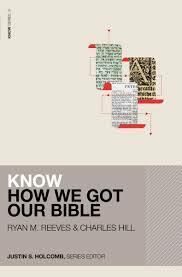 It is Ryan M. Reeves & Charles E. Hill’s Know How We Got the Bible (Zondervan, 2018) in the “Know Series” edited by Justin Holcombe. I devoted WM 46 (listen here) to challenging an online article Reeves had written on Erasmus and his Greek NT, in which he perpetuated some of the old “Erasmus Anecdotes” and added a few new ones. See also this blog post: Response to Ryan Reeves. And this one: Contrasting Ryan M. Reeves and John D. Currid: Was the study of the Bible in the original languages a hallmark of the Reformation? In the Reformation era, European scholars had a smaller number of biblical manuscripts or copies of the Hebrew Old Testament and Greek New Testament books, than have been found today. Their best copy of the New Testament, for example, dated from the twelfth century. After the rise of archaeology in the nineteenth century, we began to discover older copies of the New Testament. From these older copies, we learned that a few verses in Bible translations were not likely in the autographs, or original writings of Scripture. Older copies of John do not have these words, meaning they were not likely in the Gospel as originally written by the apostle John. I point out that it is inaccurate to say that John 5:4 did not appear in any Greek mss. prior to the twelfth century. See my text note on this passage, which shows that John 5:4 appears in Codex Alexandrinus (dated fifth century) and in the Church Father Tertullian (c. 220). Toward the end of this discussion I note that feminist theologians used to speak of the “hermeneutics of suspicion" and suggest that when you read any modern work on Biblical origins and development, even if the authors are credentialed scholars teaching in “conservative” or “evangelical” schools, one should employ a “hermeneutics of suspicion" or simply a grain of salt. Second, I provide a spoken word version of my previously posted Text Note on Luke 9:55-56. I am a new fan of yours, Pastor Riddle. Thank you for your WM - the stockpile of WM is greatly appreciated. Be well, and Merry Christmas. Listening to you all the away across the ocean in the Philippines. It's sad to see Reeves commiting such flaws. Recently he released a good video in his youtube channel about "myths about the KJV" ("https://www.youtube.com/watch?v=_wvsJk8GL6M"). What you think about this as it relates to dating methods? "First, the fact that the Byzantine manuscripts are of a late date says nothing in itself concerning the age of the text in these manuscripts. As van Bruggen explains, “One of the first things a student must learn regarding the textual history is the distinction between the age of the manuscript and the age of the text offered in that manuscript. A rather young manuscript can give a very old type of text.”[ 55] Therefore, “The fact that this text-form is known to us via later manuscripts is as such no proof for a late text-type…”[ 56] Secondly, even the strongest critics of the Byzantine text believe that the age of this text-type goes back to the end of the 3rd or the beginning of the 4th century. [ 57] Thirdly, it has been demonstrated that many of the distinct readings of the Byzantine text, which were at one time considered to be evidence for the lateness of this text-type, are attested to in the papyri manuscripts of the 2nd and 3rd century. [ 58]"
 Jacob van Bruggen, The Ancient Text of the New Testament (Winnipeg: Premier Printing, Ltd., 1976), p. 22. Ibid., p. 24. van Bruggen provides an important discussion concerning the “Age of the Byzantine Type,” pp. 22-29, and concludes by saying, “Summarizing we must conclude that the codicology [the study of manuscripts] and the history of text-corruption and text-preservation plead in favour of the antiquity of the so-called Byzantine text-type; that the absence of this type in the more ancient majuscules [a form of writing found in Greek and Latin manuscripts of the 3rd to the 9th century, using capital letters] and in the writings of some Egyptian Church Fathers before Nicea cannot be used as argument against this antiquity” (ibid, p. 29). Kurt Aland and Barbara Aland, The Text of the New Testament, trans. Erroll F. Rhodes (Grand Rapids: Eerdmans Publishing Company, 1989), pp. 50-51. They refer to the Byzantine text as the Koine text. See Harry A. Sturz, The Byzantine Text-Type and New Testament Textual Criticism (Nashville: Thomas Nelson Publishers, 1984), pp. 55-69. See also van Bruggen, The Ancient Text of the New Testament, pp. 27-28. Bill, thanks for your kind note from the Philippines and glad you've found some of the info on the blog and the WM podcasts to be helpful. VLB, good to hear from you. Yes, I have found that Reeves, in particular, needs to be fact checked (see posts responding to him on Erasmus and Biblical languages). I noticed the video but have not viewed it yet. I also must apologize, because I let the comment moderation for the blog go for nearly all of last year and just approved a bunch of backlogged comments (relatively speaking), including a couple from you. Sorry about that and I'll try to keep up with it going forward. Thanks for reading and for good input. I appreciate it. Bryant, I like this citation and the footnotes. Right on! Is this your work? It’s from the book “English Bible Translations - By What Standard” by William O. Einwechter. Anything you would add or recommend on the subject? Thanks pastor Riddle. As regards the antiquity of the Byzantine text I'd suggest Harry A. Sturz's book "The Byzantine Text Type & NT Textual Criticism."